The audience at opening night at Titusville Playhouse is always abuzz with excitement but opening night for "Sister Act" brought it to an even higher level. This feel-good show is obviously a fan favorite, There's a good reason for that. It is a lot of silly fun. 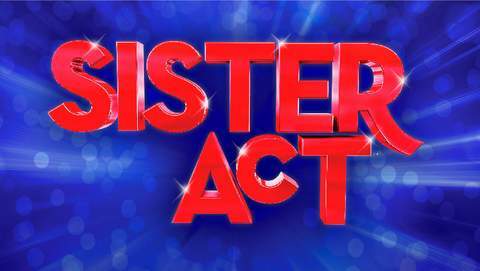 "Sister Act" tells the story of wannabe nightclub singer Delores Van Cartier who witnesses a murder. When the murderers come after her, the police hide her among the nuns at The Holy Order of the Little Sisters of Our Mother of Perpetual Faith. When Delores is told that she needs a disguise to hide from the murderous thugs, she replies, "You mean like incognegro?" Delores's over-the-top personality and inappropriate comments such as "Jesus Freakin' Christ!" are not a good fit with the strict disciplinarian Mother Superior. Delores is completely out of place until she discovers that the nuns have a choir so bad that they sing in multiple keys at the same time. With a few quick musical lessons, Delores soon has the choir singing in beautiful harmony. Soon after that, she injects some showbiz and glitz to the mix. The nuns love it. Mother Superior does not. The nuns sing lyrics such as "Dig the scene. Shake it like you're Mary Magdalene!" Mother Superior complains, "I've got celibate nuns out there shaking their buns!" Their church that was on the way to closing from lack of income and parishioners suddenly finds people coming back to church and an increase in income due to the new music style. Monsignor O'Hara goes with the flow stating, "If you only see one Roman Catholic Mass this season, make it this one!" The bad guys keep looking for Delores. The nuns get more and more outrageous and exuberant with each song and dance. Mother Superior gets more and more upset at the changes that the sinner Delores has brought to her church. The nun choir, complete with stage lighting and a disco ball, is introduced as, "The divas who believe-a. The nuns with the fun." "Take Me To Heaven" is a perfect example of an energetic, funny, toe-tapping tune which had the audience on the edge of their seats in anticipation of each new dance step, shimmy and shake of the nuns. Reca Oakley's Delores Van Cartier is sassy but sweet and loud but lovable. Oakey seemed to enjoy every moment as Van Cartier and the audience was doing the same. Sarah Biggs electrified the audience with her rendition of the inspirational song "The Life I Never Led" in which mousey Sister Mary Roberts sings about "all of the feelings unspoken, all of the truths unsaid, they're all I have left of the life I never led." Biggs effortlessly took Sister Mary Roberts from mousey to mighty as the sister found her voice and passion for her calling. "Sister Act" is an uplifting, lighthearted, musical look at why the church has lost touch with the people, how the people have forgotten the ideals that are admirable within the church, how love can be found in the most obvious places, and how much good a person can bring to the world around them if they leave their insecurities behind and "start living the life I never led." "Sister Act" runs April 1 to 21, 2016 at the Titusville Playhouse/ Emma Parrish Theatre at 301 Julia Street, Titusville, Florida.